Costus aff. 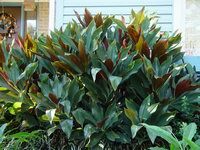 'El Whiskey' - Dark green upper side of leaves and deep red-purple undersides. Costus aff. 'El Whiskey' - It was farily common there in primary forest understory, with many small plants and a few large ones with mature inflorescences. Costus aff. 'El Whiskey' - Especially along the stems near the ligules there were long stiff hairs like this on some plants. Costus aff. 'El Whiskey' - Plants at Pantiacolla varied from being very hairy to nearly glabrous. Costus aff. 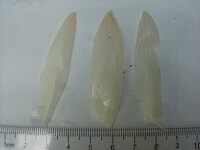 'El Whiskey' - Ligules were truncate to slightly lobed and about 10 mm long. Costus aff. 'El Whiskey' - Petioles were similar in length. Costus aff. 'El Whiskey' - This plant seemed to be forming bract appendages. Costus aff. 'El Whiskey' - Only the very lowest bract had leafy appendages. Costus aff. 'El Whiskey' - All parts of this plant were densely hairy. Costus aff. 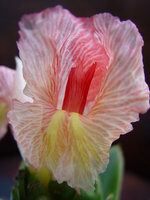 'El Whiskey' - other bracts were without appendages. Costus aff. 'El Whiskey' - Bracteole and calyx were also puberulous. Costus aff. 'El Whiskey' from Panticolla, Madre de Dios, Peru. Cultivated plant from seeds is glabrous. Ligule and petiole detail. Costus aff. 'El Whiskey' from Panticolla, Madre de Dios, Peru. Leaf upper side glabrous. Costus aff. 'El Whiskey' from Panticolla, Madre de Dios, Peru. Leaf lower side, nearly glabrous. Costus aff. 'El Whiskey' from Panticolla, Madre de Dios, Peru. Cultivated plant grown from seeds produced glabrous form. Costus aff. 'El Whiskey' from Panticolla, Madre de Dios, Peru. Cultivated plant grown from seeds produced glabrous form. Labellum detail. Costus aff. 'El Whiskey' from Panticolla, Madre de Dios, Peru. Cultivated plant grown from seeds produced glabrous form. Corollalobes, stamen and labellum. Costus 'El Whiskey' hairy form from rhizome collected at Pantiacolla, Madre de Dios, Peru. Upper leaf surface. Costus 'El Whiskey' hairy form from rhizome collected at Pantiacolla, Madre de Dios, Peru. Lower leaf surface. Costus 'El Whiskey' hairy form from rhizome collected at Pantiacolla, Madre de Dios, Peru. Corolla lobes, stamen and labellum. Costus 'El Whiskey' hairy form from rhizome collected at Pantiacolla, Madre de Dios, Peru. Photo filed with my voucher specimen at UC BerkeleyJepsen Herbarium. Costus 'El Whiskey' hairy form from rhizome collected at Pantiacolla, Madre de Dios, Peru. Costus 'El Whiskey' hairy form from rhizome collected at Pantiacolla, Madre de Dios, Peru. Ligule and petiole detail. Costus 'El Whiskey' near Shinchi Roca, 8 km east of Tingo Maria, Peru. Costus 'El Whiskey' near Shinchi Roca, 8 km east of Tingo Maria, Peru. Ligule and petiole detail. CLICK HERE for a detailed botanical description and identification key for this species (opens in new window). CLICK HERE to see a description of accession #R2261 . (opens in new window). UPDATE October 2017: During a visit with Drs. Paul and Hiltje Maas in October 2017, I learned that I had been misinformed about the Tim Plowman plant that is known as "El Whiskey". The plant that Plowman collected in the locality called "El Whiskey" in southern Colombia is not at all the same as the Tingo Maria, Peru plant noted below. 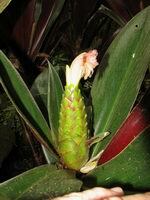 It is actually the plant that is most common in cultivation as the species Costus erythrophyllus. 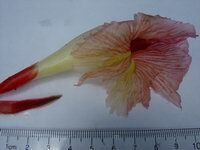 Dr. Maas is currently considering whether or not this plant form from Colombia should be included as a form of Costus erythrophyllus, or if it should instead be described and named as a new species. Tim Plowman's field notes have recently been published by the Field Museum in Chicago. His entry for this collection (No. 4396) is dated 5 November, 1974. "Colombia, Putumayo, km 42 from Pepino to Puerto Asis, El Whiskey. Finca Santa Marta Hilltop forest, altitude 1260 feet. Costus sp. nov. Maas. Spiral herb 70 cm tall, leaves dark green above, dark purple beneath, shiny." A live plant was distributed to Maas, in Utrecht, Netherlands. Per Paul Maas, it has been propagated and distributed to botanical gardens around the world. 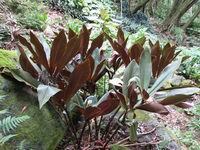 Plowman's description of a plant only 70 cm tall, with dark green upper side leaves, dark purple underneath, and SHINY, is consistent with the cultivated plant usually sold as Costus erythrophyllus. I have located a small town named "Whiskey" in Putumayo Dept. Colombia, on the Rio Guineo, near 0 48 N, 76, 34 W. which appears to be the El Whiskey where this was collected in Colombia. It is in the same region as the species C. cupreifolius, so I am wondering whether there might be some confusion with that species, known for the coppery red undersides of the leaves. 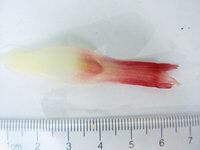 See the full description of Costus cupreifolius at PID4603. This area has been in control of the revolutionary group, the FARC until recently, but needs to be visited to determine whether 'El Whiskey' might be the same as C. cupreifolius. NOTE: as of February 2018 I am planning a trip to Putumayo for Apri or May this year, and my primary objective will be to find this plant form and also the C. cupreifolius. 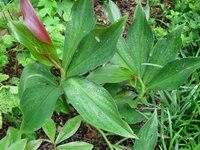 Note that the true "El Whiskey" plant form from Colombia differs from Costus erythrophyllus by having leaves that are not strongly plicate, but rather smooth. It differs from the registered cultivar form by being totally glabrous (without hairs) whereas the cultivar is quite hairy. 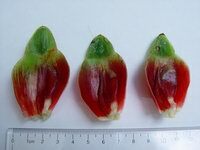 The description below and the photos on this page are from the cultivar registration for a cultivar name, but it is NOT the same plant form that was collected by Tim Plowman in Colombia. 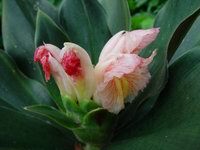 Based on recent discussions with Paul Maas, this cultivar is a form of the species Costus acreanus. Before I make any changes to the cultivar registration or photos captions, I am waiting for a final decision to be made regarding the naming the El Whiskey plant as a new species. Costus 'El Whiskey' is a registered cultivar at http://www.heliconia.org/_p/prd14/2181943665/product/costus-'el-whiskey'. Cultivar Description: Plant grows to about 1 meter tall, with large leaves deep green upper side and dark puple underneath. Leaves tend to point upwards. Vegetative parts are covered with thick hairs. Ligule is truncate to slightly lobed. 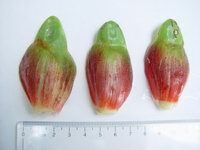 Inflorescence is of C. guanaiensis type, usually terminal on a leafy stem, with red bracts with green bract appendages. 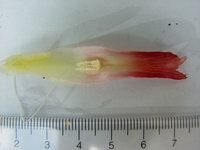 Flowers are creamy white with spreading type labellum that has reddish lines. Cultivar published in the Heliconia Society Quarterly Bulletin, Vol. 19, No. 4, December, 2013. I first saw this plant in the greenhouses at the Smithsonian Institution just outside of Washington, DC. 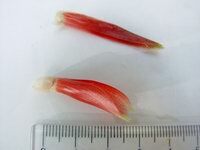 Their accession number is USBRG 1994-675, they received as a cultivated plant from the Tingo Maria Botanical Garden in Peru. It was collected by Tim Plowman from a place called Ramal de Aspuzana, which is about 65 km north of Tingo Maria. The collection date was probably in March-April of 1976 when Plowman was botanizing in that region with Helen Kennedy, the famed Marantaceae specialist. Lyon Arboretum in Hawaii has what I believe to be this same collection as their L-84.0389, Costus sp. nov., Peru: Plowman 7595; Aspusana, San Martin Huanuco; via Selby 78.844, via B. McAlpin. Planted mauka of H22-14-2 Schleichera. This same collection is at the Naturalis Biodiversity Center in the Netherlands, where it was det. 1978 by Paul Maas as Costus sp. nov., collected by Tim Plowman and M. Ramírez R., described as Cultivated herb 1 m tall. Collected in the wild as Aspuzana, Huallaga Valley at Huanuco-San Martin border, April 1976. Leaves dark green above with whitish hairs; shiny red-purple beneath. Stems dark red-purple. Sterile. NOTE: I received the following emails several years ago, which led to my confusion about the plant known as "El Whiskey". Apparently Dr. Maas was thinking the Peruvian plants are the same as the one from Colombia, but we now know that they are entirely different. Dr. Paul Maas wrote to me as follows: it is "the famous Costus collected in El Whiskey, (Colombia), never described but thriving all over the world in greenhouses. In Utrecht the cultivated plant = Plowman 4396. There is also a collection Plowman 5054 from Madre de Dios (Peru) which is cultivated in the USA. These 2 Plowman collections could very well represent the same undescribed species." Chelsea Specht also commented on this accession: "I just checked out the web link, and based on the entire ensemble of pictures I'd have to change the potential diagnosis that I sent to Mike… I had pictures of the flowers and inflo. only and only meant to say that its definitely not C. cupriefolius. Based on these photos its also not either of the others I've mentioned as possibilites. I believe this is the famous plowman collection fondly referred to as "El Wiskey". Ray Baker has it at Lyon as well, and has it growing in several different areas. The Maas' and I also saw it in the living collection at Berger's Bush in the Netherlands. If so, its Lyon collection number 81.0901 and Plowman number 5054 (NOT collected in 1994, but rather accessioned to Smithsonian at that time). Ray has it in his database with lots of nice photos. Based on my discussion with the Maas', it is my understanding that the species has not yet been named. We were just calling it "el wiskey". Another cultivated collection of this taxa is at Lyon Arboretum in Hawaii. L-81.0901 Listed and described there as Costus aff. erythrophyllus (leaves large, fuzzy) Peru: Plowman 5054, "El Whiskey"?, (ID as C. sp. nov. by P. Maas); Shintuya, Madre de Dios; road from Atalaya to Salvacion; 650m elev, in understory of wet primary forest. 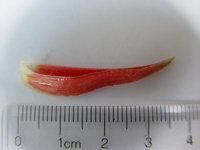 "1m" (2 m), leaves large, reddish, hairy. DNA to Chelsea Specht. Plantings: 1) mauka of H23-8-5. 2) above (10' makai/ewa of) H28-27-1; red; good, Mar 93; in flower, 28 Jul 2001. 3) near H4-11-7, mauka of up trail, below log. This specimen is also at the herbarium in the Netherlands, Naturalis Biodiversity Center. It was collected by Tim Plowman and Wade Davis on February 9, 1975. Described as herb to 1 m tall in shady, partially inundated forest remnant. Leaves dark blackish green above with pale brown hairs; shiny beneath, dark wine-red to purplish red. Bracts light yellowish green, red toward base. Ovary white, calyx red. Seeds black. R2261 - Collected by Tim Plowman in 1976 near Ramal de Aspusama (Aspuzama), near the Rio Huallaga about 65 km north of Tingo Maria. Plant was accessioned by the Botanical Garden in Tingo Maria to the Smithsonan (USBRG#1994-675). I have been growing this plant for several years. It is ONE FANTASTIC LANDSCAPE PLANT! Deep green foliage with purple undersides, forms a nide clump 2-3 feet tall, produces beautiful white and red flowers on dark green appendaged bracts. I have grown it in various conditions form filtered shade to 3-4 hours direct sunlight, and it seems to do best in light shade or filtered shade, or just a couple hours of morning sun. I tested it for hardiness in the winter of 2005 and it barely came back here from a large clump, so I would rate it zone 9B for hardiness. 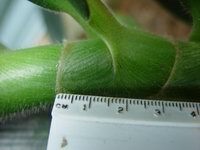 It is relatively easy to propagate and not difficult at all to grow given normal Costus conditions. 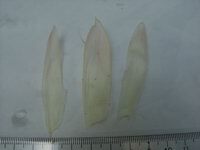 R3265 - seeds collected in Pantiacolla, produced a plant that is mostly glabrous as found on some examples in habitat in Pantiacolla. Bracts were not appendaged on these plants, but the general form of the plant and the flowers are nearly identical to the 'El Whiskey' form. It has been vouchered at the UC Berkeley, Jepsen Herbarium, UC2045820. R3322 from rhizome at Pantiacolla, is nearly identical to the 'El Whiskey' plants at Lyon and at the Smithsonian. This accession has been vouchered at the UC Berkeley, Jepsen Herbarium, UC2045812. R3383 from Shinchi Roca, near Tingo Maria, Peru. Plants in habitat identical to the cultivated form from Plowman at Lyon and Smithsonian. 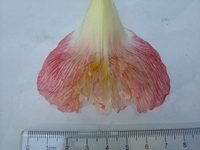 This is an undescribed species of Costus from the tropical rainforests of Colombia and Peru, collected many years ago by famed botanist Timothy Plowman. The botanists have generally referred to it as "El Whiskey" for the place where it was first discovered, so that is what I am calling it here. It is ONE FANTASTIC LANDSCAPE PLANT! Deep green foliage with purple undersides, forms a nice clump 2-3 feet tall, produces beautiful white and red flowers on dark green appendaged bracts. I have grown it in various conditions from filtered shade to 3-4 hours direct sunlight, and it seems to do best in light shade or filtered shade, or just a couple hours of morning sun. 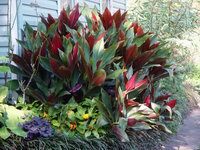 I tested it for hardiness in the winter of 2005 and it barely came back here from a large clump, so I would rate it zone 9B for hardiness.-á It is relatively easy to propagate and not difficult at all to grow given normal Costus conditions.